TOWERING FIGURE: Kathy Clarke (right) has been stacking rocks most of her life, as a hobby and as a way to enhance the outdoor experience. Kathy Clarke was in the car on the way back to her home in Atascadero. It was hot there, as that city often is, so she and her husband had decided to spend a quiet evening in Cayucos. They ate dinner, and then, Clarke had an idea. “Let’s take the 46 home,” she suggested. The views of Morro Bay that road offered were perfectly suited to what Clarke had in mind. Right after dinner, right when the sunset would hit, right there on that road would be the setting Clarke needed for what she had to do. She had to balance some rocks. 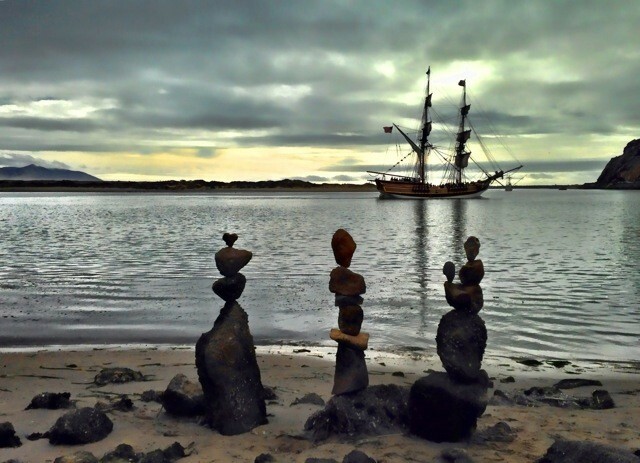 ROCK THE PLANK: When pirate ships came to Morro Bay, Clarke rushed to balance some nearby rocks before the ships vanished. I don’t know what I had expected. The answer seemed so simple. Initially, I heard about Clarke via one of our taller, more debonair news writers and the pitch was unusual: There’s a local woman who has been invited to participate in the Balanced Art World International (BAWI) festival—an event featuring around 14 of the world’s most talented rock balancers that takes place in Ottawa this August. I was sold. What exactly is rock balancing? How do you do it? Are there magnets? Are the stacked stones just signals to extraterrestrials, used as target markers for an all-out, human conquest? Do you stack rocks competitively, in a Jenga-like fashion, until the loser is crushed in a violent, literal sense? If not, then why? Why would you do this? Stone piling isn’t actually all that strange. For thousands of years, humans have stacked rocks as landmarks, signposts, ceremonial markers, and, quite likely, as a way to kill boredom before the invention of the Nintendo 64. Known as cairns, these monuments can still be found in the far-flung reaches of nearly every continent. They serve purposes both pragmatic and aesthetic, with some contemporary artists, like Andy Goldsworthy and Michael Grab, pushing the limits of artistic and natural design with 8-foot-tall inverted cones of interlocking rocks and entirely self-supported, stone bridges. It is an ancient art with an increasingly modern following. But, for Kathy Clarke, the whole thing really began as a kind of hobby. TOP OF THE LAKE: Clarke often sets and photographs her rock balances in a scenic location, like that of Atascadero Lake (seen above). She’s been stacking rocks since she was young. Raised in Los Angeles, Clarke’s always been fascinated by the outdoors and by geology. About 20 years ago, she moved to Atascadero where she runs her primary business, Lady Kate’s Photography. And it is her professional occupation as a photographer that largely informs her interest in stacking stones. The exact types of rocks and the time it takes to gather and stack them depend completely upon the elements, Clarke’s mood, or whatever picture she might have in mind. She doesn’t have any preferred method or materials—other than her signature, heart-shaped stones. Size and shape are really the only two main attributes. 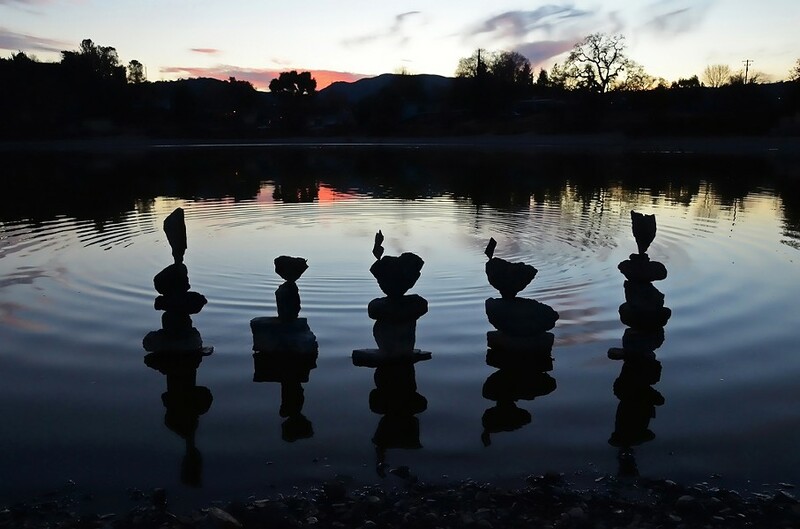 Sometimes, the venture will be entirely spontaneous, like the time Clarke was in San Simeon, standing by a fence railing, and happened to see some choice stones for stacking. Sometimes, the venture will be meticulously planned, as it was when Clarke set up stones on one of the beaches by Morro Rock in the hope of framing them in the foreground of some visiting pirate ships. The result was a success, but the public attention she received was entirely unexpected. 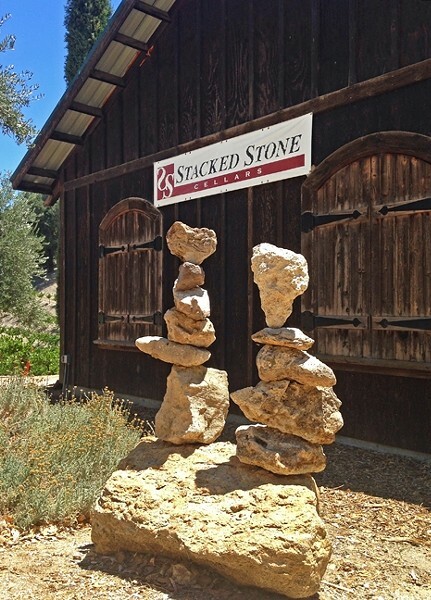 STACKS ON STACKS: Clarke’s signature piece, a heart-shaped rock, can be seen in her rock balances for the appropriately-named Stacked Stone Cellars in Paso Robles. 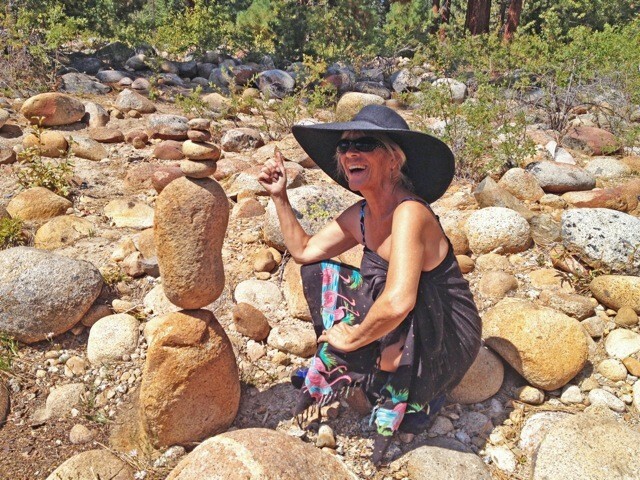 Clarke offers similar stories from her time in Texas and back here on the Central Coast, stories where strangers and friends alike have expressed a keen wonder at her skill for both the precision and patience required with such a feat as rock balancing. There’s even been some professional interest in her talent, for landscape decorating and balancing classes. More and more, what was once a somewhat secluded and solitary venture for Clarke has evolved into something social and international in scope. “There are these groups on Facebook, so that’s where I get to watch many of the international balancers and what they’re doing. I learn a tremendous amount—not only about rock balancing, but about different places in the world. I’ve actually added Slovenia to my list of places. It is stunning. I just had no idea until some guys were posting some photos of balances there,” Clarke said. One of those Facebook groups is how Clarke became involved in BAWI in the first place. Now, she has plans to expand her purview, with balances all over the county from the Elfin Forest to the top of Cerro Alto. Now, the Internet has allowed her to join communities of fellow rock balancers, who share photos with each other, and inspire new followers of this very old art form. And now, I feel foolish. Now, I’m beginning to get why Clarke, and so many others, do this. Jessica Peña can’t balance rocks, but feel free to suggest what she should (books, pizza, etc.) at jpena@newtimesslo.com.